The second round of the Enduro World Series (EWS) returned to our shores and the epic trails and township of Derby with Isabeau Courdurier and Martin Maes crowned the winners. 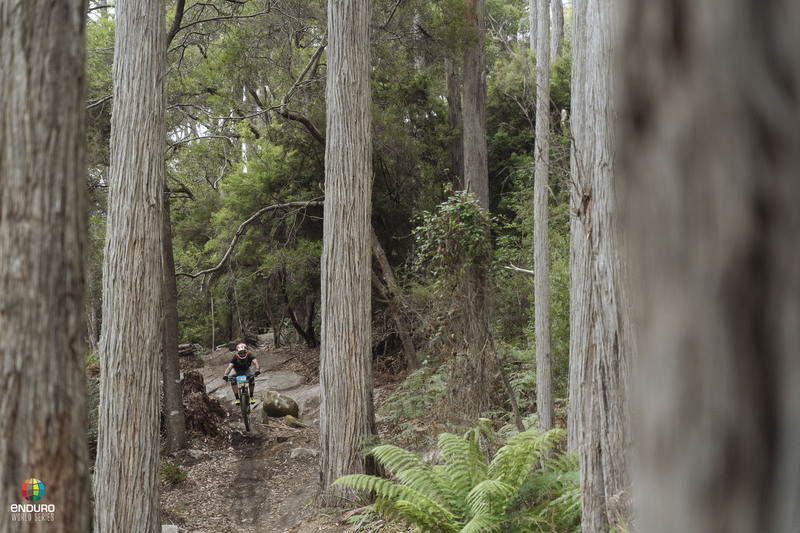 The tiny town of Derby in Tasmania’s North East was once more transformed into one of the biggest party’s of the year thanks to the EWS Shimano Enduro Tasmania. Thousands of noisy fans lined the tracks to see their idols race on Derby’s iconic trails. Racing got underway on Saturday with just one stage, the all important Queen’s Stage, the longest in the race which offered up extra points. Right from the off, Courdurier (Intense-Mavic Collective) and Maes (GT Factory Racing) stamped their authority on the competition to take the win. Isabeau Courdurier carries on where she left off and put a 4 second gap to the rest of the field. There were five big stages offered up for Sunday, and in the women’s competition Courdurier’s dominance was never really in doubt. Winning three of the six stages she finished the race with a comfortable 22 second lead, cementing her place at the top of the series rankings. In her very first EWS race, the USA’s Jill Kintner placed second with a win on stage two! And it was Tasmanian local and reigning Asia-Pacific Enduro Champion Rowena Fry who scooped third. Another faultless stage for Martin Maes continuing his stage winning streak of 2019. Maes won four of the six stages, with only Kevin Miquel and Jesse Melamed (Rocky Mountain/Race Face Enduro Team) able to rob him of a clean sweep. With an 18 second lead heading into the final stage of the race, Maes cruised home to claim a second consecutive race win and cement his series lead. Florian Nicolai (Canyon Factory Racing) bettered his third place finish in Rotorua last weekend by claiming the second step of the podium this time around and maybe the biggest result being Australian Connor Fearon (Kona Factory Team) scored his first EWS podium on home soil in third in his second EWS event? One damn big year ahead for Connor! 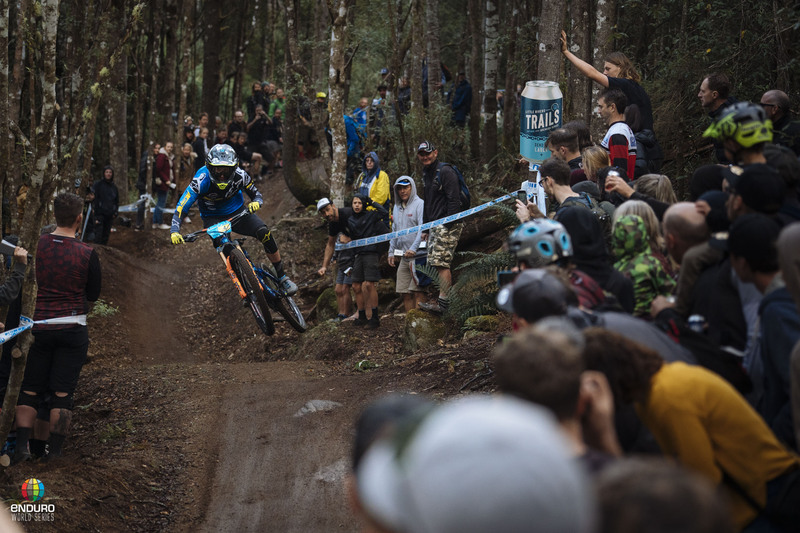 Sam Hill rode hard all weekend, taking the win on the final stage, finishing up in 9th. Lionel Sequera a freerider of years gone by is chasing Karim Amour for the lead. In the U21 Men Antoine Vidal (Commencal Vallnord Enduro Racing Team) was untouchable, forcing Australia’s Romy Kyle and Canada’s Kasper Woolley to settle for second and third respectively. There was a strong Aussie showing in the U21 Won, with Fenella Harris picking up first and Laura Craft in second place. Reigning Masters Champion Karim Amour (Miranda Racing Team) had a strong start to his race, but ultimately had to settle for second with fellow Frenchman Lionel Sequera securing the win. Australia’s Jeffrey Beeston came third. In the Master’s Women Michelle Gane proved too strong for Mary Mcconneloug. In the team competition Gt Factory Racing were named Team of the Day, and also lead the rankings. The series returns on the weekend of May 14th for the EWS Powered by Freeride Madeira on the beautiful island of Madeira, Portugal. Behind the scenes of Connor Fearon’s section in Gamble!